Kathy Roberts lives in Placer County, California. Originally from South Dakota, she still loves the feel of the prairie and loves the wide open spaces. Kathy has been around horses all her life and has been involved in everything from 4H to High School Rodeo and is currently team roping with her husband, Elliott She coordinated the 4-H Horse program in Placer County for several years and was instrumental in creating the county’s Horsemanship Program. When her son was in High School Rodeo, she began coordinating the district as well as the State Queen contest, and continued to be active in both High School and Pro Queen contests long after he had graduated. Beginning riders are her favorite to teach. She believes a good set of basic skills will set up a rider to in any direction they choose. the Emergency Response Institute as well as the National Association for Search and Rescue bookstore. 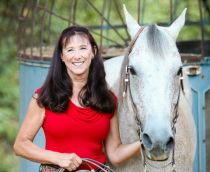 Besides her second love, horses, (her cowboy husband is her first love) Kathy is interested in the history of the Old West, traveling, and of course, writing.